Russia has state run TV. The United States has TV run State. The phone calls between Trumpery and Sean Hannity come early in the morning or late at night, after the Fox News host goes off the air. They discuss ideas for Hannity’s show, Trumpery’s frustration with the ongoing special counsel probe and even, at times, what he should tweet, according to people familiar with the conversations. When he’s off the phone, Trumpery is known to cite Hannity when he talks with White House advisers. 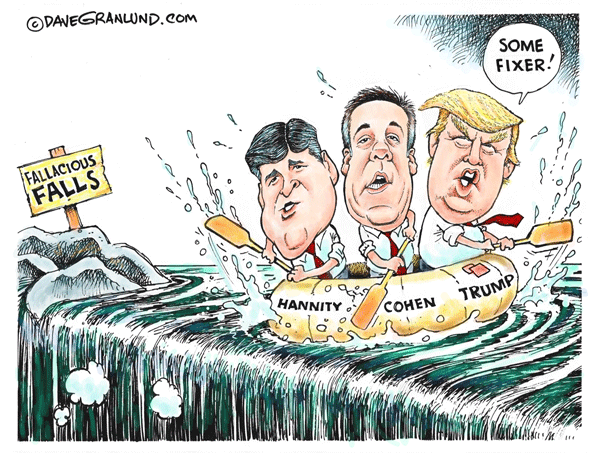 The revelation this week that the two men share an attorney is just the latest sign of how Hannity is intertwined with Trumpery’s world — an increasingly powerful confidant who offers the ­media-driven president a sympathetic ear and shared grievances. The conservative commentator is so close to Trumpery that some White House aides have dubbed him the unofficial chief of staff. This portrait of the interactions between the Trumpery and the talk-show host is based on interviews with more than a dozen friends, advisers and associates of the two men, some of whom spoke on the condition of anonymity to describe private conversations.